3 miles, 90 minutes, walk number 1 – should be easy right? Well, it probably is one of the easier ones – but it wasn’t as easy as I thought! Parked in the Clough Head carpark at about 9:30, there is a cafe/shop here but apparently it doesn’t open until some time after 9:30! 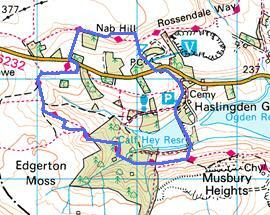 Anyway, started off through the back of the car park and up towards Nab Hill on Oswaldtwistle Moor. 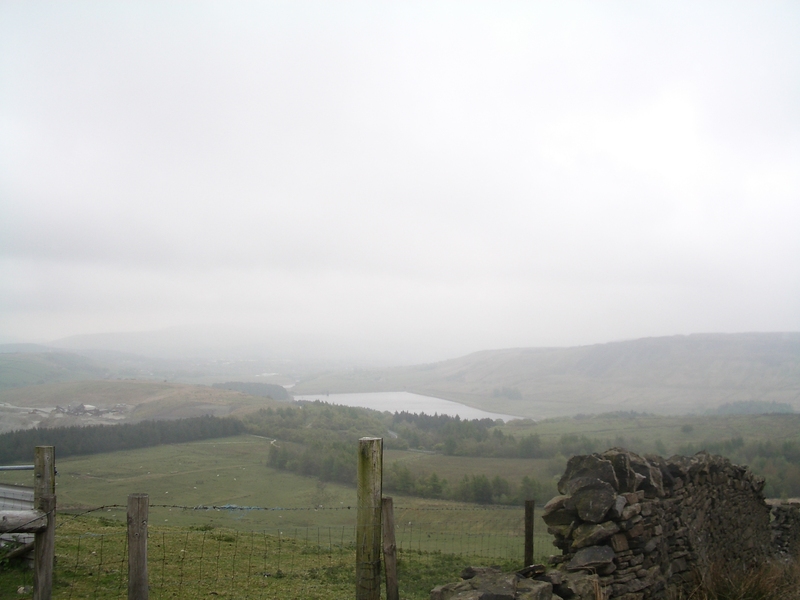 I crossed the Rossendale Way and took the alternative route described in the book which takes you onto the top of Nab Hill. It was cold and windy on the top, luckily I had my newly purchased Berghaus Smoulder zip-neck (currently £39 at Cotswold Outdoor if you’re interested) complete with thumb-loops. I tromped across the top of the hill and then angled back down to the Rossendale Way. Turning left over a ladder style, crossing a sheep filled field until I returned to the B6232. 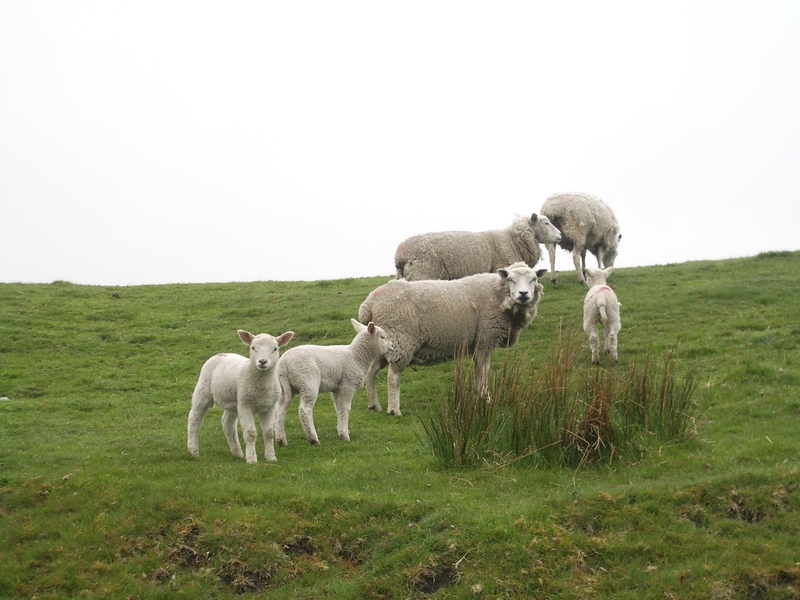 After crossing the road I leave it on a farm road past many more curuious sheep and their lambs. The route curves across the head of the valley towards Musbury Heights and Edgerton Moss to the south and the book is a little ambiguous on the route to follow, I guess correctly and cross a small bridge before leaving the path to the left (east). I cross a field before hitting a stony path – littered with derelict farm building, after one of which I come face to face with a large bullock! Behind the bullock are some cows with calves so I decide that caution is the better part of valour and walk round three sides of the field to get to my destination. At that destination is a board describing the history of illegal whisky distilling in the area, the most interesting character was a guy names James Morris from Pike Lowe (near where I crossed the B6232) who in 1859 was fined £230 for illegal whiskey distilling, police found a secret cellar under the farm that had been built by James’s grandfather. The fine was such that James had to sell Pike Lowe to pay it, and so he took up work in a water-mill further down the valley and lodged there. 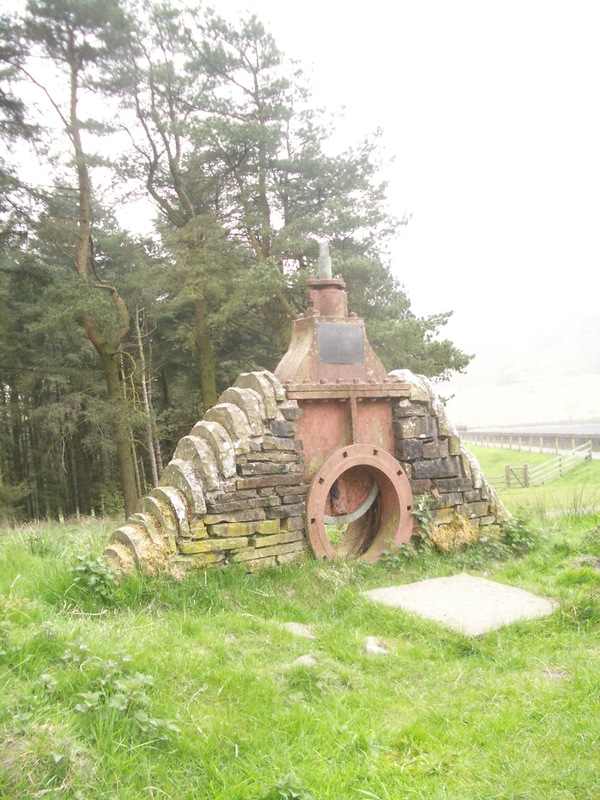 James was never in trouble for whiskey distilling again, but when builders demolished the water-mill in the early 20th century – they found hidden rooms containing a whiskey still! The going here is difficult, there are so many stones around I really have to watch my footing, and the rain has made the stones I do use slippy. The path continues until it winds around a larger derelict farm house, crosses a stream, climbs a little, and then drops down into a plantation. Here is drops steeply to a lovely little brook on the edge of Calf Hey reservoir. I have a rest here and then continue across the stream and follw a track on the side of Musbury Heights. When level with the end of the reservoir I descend to it and cross the dam wall. On the other side is one of the old valves from the original dam. From here I climb through a carpark (which was an option to start the walk from but there is a charge! ), then it is a short walk up through some woods back to the road and the car park. The weather, and the narrow twisting and undulating paths made this a more difficult walk than it looked on paper; but it was a good walk and I think I’ll be back in better conditions. There look to be a number of options for extending the walk, either by widening the loop to include Ogden reservoir and Jamestone Quarry, or by adding a southern loop up Musbury Heights.